If you are interested in Olympic National Park Overnight Backpacking, come and join us at Kaiyote Tours! There is nothing more wonderful than waking up in the backcountry wilderness of Olympic National Park; mornings are quiet and serene. Night skies are brilliant with stars and the air is clean and pure. To awake next to a crystal clear lake or stream is an incredible experience. Along the coast, the sound of the ocean surf will bring sweet dreams to you. Nature has an amazing way to bring you closer to yourself and all that truly matters. Olympic National Park has over 600 miles of hiking trails! Covering 1440 square miles (922,000 acres) the park contains some of the most spectacular wilderness in North America. 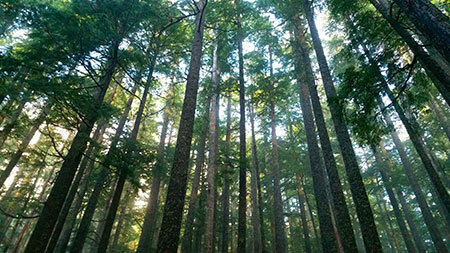 Olympic National Park is part of the largest temperate rainforest in the world and contains some of the last remaining old growth forests. Elk and deer can be seen roaming the meadows and river valleys. Bears, mountain lions and bobcats are in the forested areas and small mammals like marmots, chipmunks and snowshoe hares are abundant. 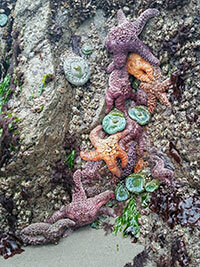 Along the Pacific Coast, low tide reveals a wondrous ocean world amongst the rocks and shore pools. Sea otters, seals, sea lions and whales can be seen from shore. During the summer, the colorful wildflowers and alpine plants are stunning. Over 300 different species of birds have been identified. From the top of Mount of Olympus to the Pacific Coast, Olympic National Park is best seen with boots on the ground in the wilderness of the backcountry. So many choices: Do you want to camp deep in the old growth forest or atop the mountain meadows or in the massive valleys of glacier fed rivers or along the ocean coast? There is great backpacking all year round in Olympic National Park. If these dates don't work for you, let us know what dates you need. We can arrange trips for any dates you need. Let us know when you would like to visit Olympic National Park. Concerned about carrying a heavy pack? If you want to go backpacking and are concerned about carrying the weight, you can have your gear carried by a porter. Our porters can carry up to 50 pounds. One porter can carry the gear for almost two people or one porter can lighten the load for a group. It is best to figure on having one porter per two people. The cost is $175 each way per porter. You can hire a porter for only the hike in, if you want to carry your gear out. If you will be organizing your own trip and would like a porter to help carry your gear, we offer porter service for $265 - $295 per porter. Price depends on distance and elevation gain. For tours south of the Hoh Rainforest, there is $65 additional fee. Backpacking fee includes back-country permit, gear and food. Payment and cancellation policy: At the time of reservation, a non-refundable fee of $20 per person per day is due. The remaining balance is due 2 months prior to the trip and is non-refundable. We accept Visa, MasterCard, Discover, American Express and PayPal. 8) Food: Let us know if you require coffee/caffeine, vegetarian or anything special. Although we provide all the necessary gear, you can also bring your own gear. Not included: Transportation to and from trailhead and National Park entrance fee for your vehicle. If you will not have a car, we can make transportation arrangements for you. 1) If you want to fish, let us know in advance. 1) Warm base layer, top and bottoms for sleeping. Like Smartwool underwear. 2) Short and long sleeve shirt. 3) Shorts and light weight pants. 5) Wind/rain pants and jacket. Gortex outer shell is recommended. 6) Hats (one for warmth and one for sun), gloves/mittens and neck gaiter. 7) Boots: must be already broken in! Blisters will absolutely ruin and put an early end to your back-country trip. Hiking boots need to go above your ankles to support and protect your ankles from injury. Sprained ankles are the most common injury in the park. 1) Does anyone in your group require caffeine in the morning? If so, in the form of coffee, tea or energy drinks? 2) Does anyone in your group have severe allergies to any type of food or insect stings/bits? 3) Is anyone in your group a vegetarian or have special diet requirements? 4) Are there any foods you especially hate or especially love or are you open to all types of food?